There are more mold health issues caused by black mold and other types of mold than you might imagine. Toxic mold symptoms include many respiratory symptoms but also some other health problems. While some types of mold are better known for causing health problems than others, the Environmental Protection Agency reports that all types of mold can cause health issues. The more toxic mold you have in your house and the greater the length of time you are exposed to it, the more health issues you may experience, but even limited exposure can cause health problems in sensitive people. If you or members of your family are suffering from any of these toxic mold symptoms, mold may indeed be the cause of your symptoms. You can have a professional come to your home to do a test for mold spores in the air. The only way to really treat mold health issues is to clear up the mold problem in your home. Treatments like antihistamines or over-the-counter or prescription allergy remedies won’t help much. 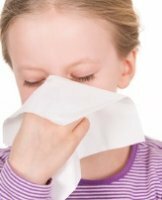 Antibiotics will help clear up opportunistic infections, but only if the person suffering the illness is no longer exposed to the toxic mold. Cleaning up toxic mold in a home can be quite an undertaking. Hard surfaces like tiles or linoleum must be scrubbed with a biocide designed to kill mold. Carpet, carpet padding, drywall and insulation must often be removed and replaced. Some homeowners prefer to do the work themselves but many choose to call in a professional. One reason some people want to do the job themselves is to save money, but if you have homeowner’s insurance, it will often cover the cost. Also, you may save money in the long run by calling in a professional to make sure the job’s done right. If you miss just a little bit of mold, it can grow back and spread to other parts of your home. You will continue to suffer toxic mold symptoms, and will end up having to do the job all over again. If you decide to do the job yourself, make sure you wear protective clothing so the toxic mold doesn’t come into contact with your skin and so you don’t inhale too many mold spores. Protective gear should include rubber gloves, an N-95 respirator face mask, goggles and long pants and a long-sleeved shirt that you will wash as soon as you’re finished with the task. Duct tape plastic sheets over the doorways of all rooms in which you’re working so that mold spores don’t spread through the air to other rooms of the house. After cleaning up the mold in your home, have another mold test conducted to make sure all of it was cleaned up. If you missed even a little, it will mostly likely grow back and your symptoms will just continue. It’s recommended that people suffering from symptoms of mold-related illness not attempt to clean up mold themselves. The process of scrubbing mold or even just handling moldy materials like carpet or drywall usually causes mold spores to become airborne and they are easily inhaled. This frequently causes symptoms to worsen, sometimes to a dangerous extent. If you do decide to handle the mold removal yourself despite symptoms of mold-related illness, it is imperative that you wear all the recommended safety gear and follow standard safety precautions. We recommend scheduling a free consultation with a mold removal specialist because a specialist can offer free advice about important safety precautions. Follow the link to find a list of mold removal specialists offering free consultations in your town. This mold was caused by a leak in the window. 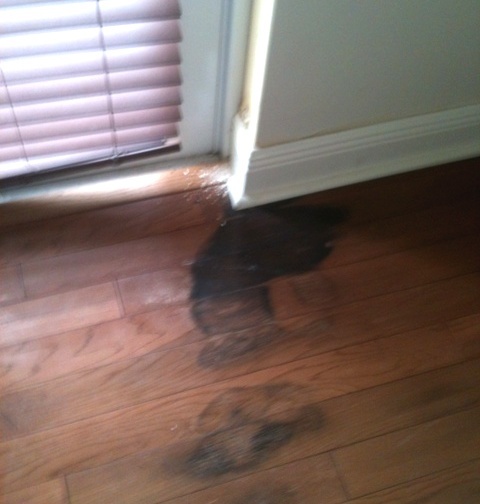 The mold was in the hardwood floor, as well as the subfloor below.